One would think that Google Notifier for Mac would the perfect way to alert a user to requests to chat, especially requests for Google Video Chat. Google Notifier for Mac was "Last updated August 18, 2006". Yes, roughly 50 net years ago. It's clearly one of those infamous abandoned Google hobby projects. It provides notifications for incoming email and calendar events only. The download page documentation links display Windows Notifier documentation; you have to install it to find out what it does (once you install there is a Help menu with some content). Google recommends this utility for transforming an OS X Address book into the (yuch) CSV format Gmail can handle: A to G The easy way to get your Mac OS X address book into Gmail. 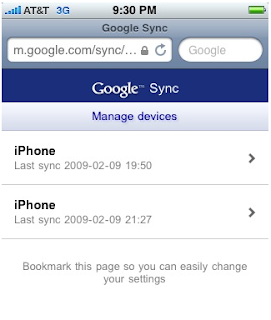 This is one possible path on the way to using Google's ActiveSync implementation to sync contacts from iPhone to Google and gSyncIt to get them from Outlook to Google. I'm approaching the problem of integrating my work, Gmail and OS X contacts with great care. It feels like juggling antimatter -- the data models are very different. There's a lot of potential arrow-of-time entropy risk -- data loss that can't be reversed. Now that we're in the blessed era of iPhone ActiveSync to Google Calendar and Contacts I've been comparing Syncit for Outlook 2007 ($10) to Google Outlook Calendar Sync (free). Both of these products have had serious bugs in past experiments. gSyncIt has the big advantage that it will also sync Outlook Contacts, Google's current Outlook Sync only does Calendar items. gSyncIt also has many more customization options. On the other hand, gSyncIt does not do meeting attendees. Update 2/11/09: The gSyncIt Add-on is definitely causing Outlook 2007 outlook.exe process hangs. Not necessarily their fault; Microsoft's Add-ons have the same problem. The Outlook 2007 Add-on architecture makes DOS 3.1 TSRs look good. I've had to uninstall gSyncIt. I suspect the only safe way to get Outlook contacts to Gmail will be to periodically wipe them from Gmail, then export from Outlook and import into Gmail. Annoying! Update 3/17/09: Google Calendar Sync was working until recently. It started giving me error code and nonsensical "connect to internet" messages. I had to delete my Google calendar data and redo the sync to make it work; nothing related to the error messages. Fortunately I only do 1 way sync! I've been rather unimpressed with Google/Gmail Tasks. They remind me of Apple's disastrous Mail.app tasks, except they don't even have categories. ... so try it out and let us know. P.S. There's a new gadget version of Tasks too -- so if you want to add your same task list to iGoogle, now you can. If they get the API and calendar integration I'd love to see Appigo's iphone ToDo.app sync to Google Gmail tasks instead of to Toodledo.